You are here: Home » Who is Dennis Skinner? Today Shut Out The Light is proud to announce that it will be releasing DENNIS SKINNER: NATURE OF THE BEAST in UK cinemas from 8th September 2017. Written and Directed by Daniel Draper and Produced by Christie Allanson and Daniel Draper, it is a feature-length documentary about socialist, trade unionist and Labour politician Dennis Skinner. The film will also feature in the East End Film Festival on 17th June. Raised alongside nine siblings within a mining village, Dennis has fought for the rights of the working class for over 50-years. Uncompromising in his views and with a set of incorruptible principles, Dennis is respected and feared on both sides of the House of Commons. 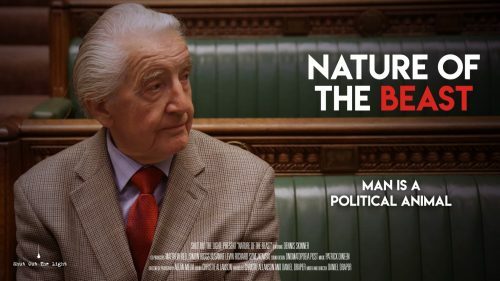 ‘Dennis Skinner: Nature of The Beast’ looks at what lies behind his passion and drive, and tracks his rise from a local councillor to today where he is one of Britain’s most recognisable politicians – known as ‘The Beast of Bolsover’. After interviewing Dennis for a previous project – a documentary about Robert Tressell’s seismic book, ‘The Ragged Trousered Philanthropists’ – director Daniel Draper approached Dennis about making a feature-length documentary about his life and contribution to British politics. After a 90-minute phone conversation about football, nature, literature, musicals, Woody Allen films (and a little bit of politics) Dennis decided he trusted Dan to make the first documentary about him and his politics. Photography began late 2014 after a small grant was received from the National Union of Mineworkers and several union branches. Due to the minuscule budget, all the crew volunteered their time and expertise over a period of 18-months, travelling a combined 3,000 miles across the country and working around Dennis’s busy schedule. After photography was wrapped mid 2016, a successful crowd-funding campaign raised archive and post-production costs. The autumn of 2017 will mark 3-years since the birth of the project which, thanks to the hard work and commitment of a small team, is now ready to be released.